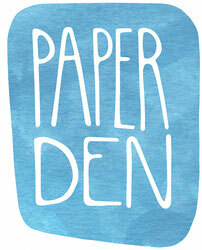 Collage - De website van paper-den! Possibly my favourite way of working is to use different kinds of media in a collage. I paint, draw or cut-out parts of the illustration separately and assemble them onto a sheet of paper to create a finished piece. To achieve the right colour I will often paint white paper with watercolour and then cut it to the shape I want. I also like to encorporate textured paper or paper with a print such as origami paper.